The image below illustrates the comp time tracking capabilities. Actually, tracking compensatory time is only one of many things the product does. 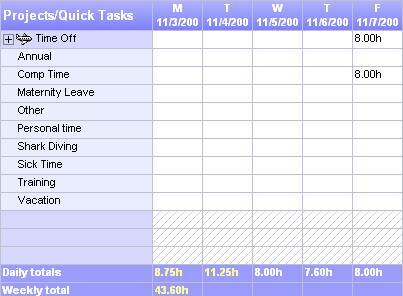 Before you can track comp time, you must have an employee timesheet and employee schedule. Our product has those things, which means comp time calculations are automatic. They occur on the first day of every week. Check out the images below for a quick understanding of how the product works. 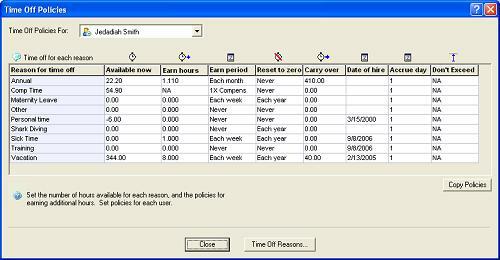 The dialog above shows the Time Off Policies. It lists each reason an employee can take time off. Your organization can customize this list. One of the items listed here is "Comp Time." Employee policies can be configured to compute comp time based on the previous week's timesheet. The timesheet hours are compared with the employee's schedule. The difference is added to the employee's comp time policy. The dropdown choices above help you configure comp time. We offer "1X Compensatory," "1.5X Compensatory," and "2X Compensatory" choices. As indicated earlier, the algorithm multiplies extra hours from the previous week's timesheet times the multiplier choices here to arrive at extra comp time. Those hours are added to the employee's policy. They can use this extra time anytime they like. The Timesheet clipping above illustrates taking comp time on a Friday. Simply enter the number of hours you wish to take, and the automatic accrual subtracts the hours from your time off policies. And hopefully, you'll earn more next week!